One constant I’ve recognized in my writing is how much feedback I like to have. I’ll write an email, and I’ll send a draft to a colleague to see if it’s right. I’ll write an application to something, and get feedback from friends to see if it makes sense. I’ll write a blog post, and send it to my wife. But being a solo entrepreneur and working alone at home, I often find myself stuck, not being able to get a friend to look at my work. My wife can only take so much. At the same time, I’ve gotten hooked on how simple it is to order a cab on Uber. Click a button, and a bunch of steps happen I don’t need to worry about. So now, Draft, the version control for writing tool I’m making, has a magic “Share with an Editor” button. One click, and you can send whatever you’re working on (Christmas letter, cold email to a potential customer, blog post, etc.) to a staff of folks who can review your writing and suggest edits. 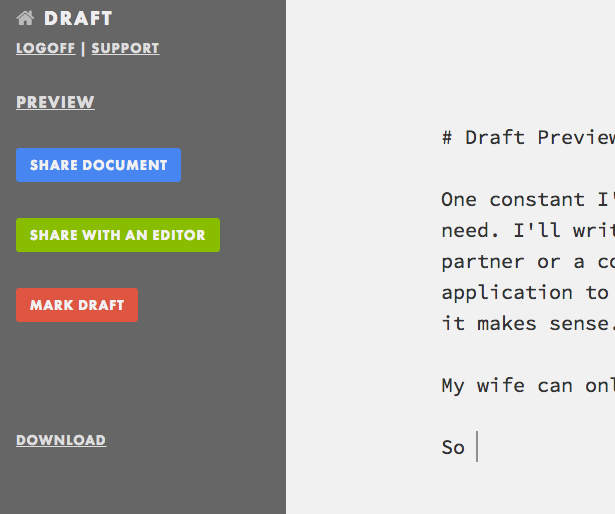 What is extra awesome, is that Draft makes it easy to ignore or merge in their changes. Do what you want with them. Just yesterday I had this blog post edited as well as a customer development type email I was sending to someone. I got a bunch of great edits back. Some I ignored. Most I merged into my work. I’m slowly sending beta invites to people that want to give Draft a good trial before I release it to the public. Thank you so much, everyone, for all the feedback. It’s definitely helping me make a better product. It’s awesome: I love the simplicity combined with power of markdown. If you’d like to try it out early just add your email to the form below.